When exactly was the first day of 1751? That’s not a trick question. The Legal Genealogist isn’t out to flummox anybody. But if you’ve got an event in your family history that occurred on the first day of 1751, figuring out when exactly it occurred may not be quite as easy as it appears. 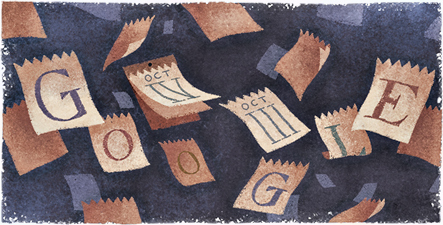 Yesterday’s Google Doodle would give you a hint of the problem. Go ahead and click on the image here if you haven’t already gone ahead and looked at it. part of a realignment of the Julian calendar, implemented by Julius Caesar in 46 B.C. In the mid-1570s, it was discovered that the Julian calendar was actually 10 days behind the seasons of the year. For example, Easter began falling later in the spring than it should have and eventually would have drifted into summer. The calendar creep was the result of the solar year (the time it takes Earth to make one revolution around the sun) being around 11 minutes shy of the full Julian calendar. To be precise, the solar year is actually 365 days, 5 hours, 48 minutes, and 46 seconds. Because even though it’s “today’s most widely used system,” it wasn’t adopted everywhere at the same time. Yeah, that means exactly what you think it means. From 1582, when the Gregorian Calendar was declared effective, until 1752, the first day of the year was different between England (and its colonies) which followed the old Julian Calendar and the continental countries where the Gregorian Calendar was followed. And the dates didn’t match up anyway. So when exactly was the first day of 1751? I get to give my favorite answer: it depends. If it was England, it was still 25 March 1751. If it was, say, Italy, it was January 1. Now let’s say you have something that occurred in 1751. Say, just for the sake of argument, that there was a bright meteor that flashed across the sky, visible on just one single day, from England to Italy. If it was recorded as visible in Italy on the first day of 1751, when was it visible in England? It wouldn’t have been January 1 in England. It wouldn’t even have been close to January 1 in England. Between 1582 and 1752, not only were two calendars in use in Europe (and in European colonies), but two different starts of the year were in use in England. Although the “Legal” year began on March 25, the use of the Gregorian calendar by other European countries led to January 1 becoming commonly celebrated as “New Year’s Day” and given as the first day of the year in almanacs. It’s all a matter of time. I had a similar inspiration http://ohiomayflower.blogspot.com/! It does appear that all of the Italian jurisdictions did convert, since they were under the influence of the Pope. Certainly confusing! Something I discovered way back when I started researching my Quaker ancestors which made it even more difficult was that in their records, you will see the 20th day of the 2nd month of the year 1747. Hmmmmm. What day is that? Move up a few years to the 20th day of the 2nd month of the year 1757, and what day is that? Even after all of this time, I’m still not sure I know! Elizabeth, this “old” text,”Genealogical Research: Methods and Sources”, published by The American Society of Genealogists (ASG) in 1960 and edited by Milton Rubincam, President,ASG,may help. Looking at p. 34 of a digital image at Internet Archive (https://archive.org/stream/genealogicalrese00amer#page/34/mode/2up : accessed 6 October 2016) my interpretation of the explanation implies that prior to 1752 “the 20th day of the 2nd month of the year 1747” would be the 20th day of April 1747 (Old Style) and 3 March 1748 (New Style) whereas “the 20th day of the 2nd month of the year 1757” would be 20th day of February 1757 (New Style). This all assumes 25 March is the beginning of the New Year, 1747 and 1 January is the beginning of the New Year, 1757. This is helpful! Thank you, Leslie Karr!